The chemical equation for photosynthesis involves the input (reactants) of carbon dioxide, water, and sunlight to produce the outputs (products) of glucose and oxygen. This chemical process is a fundamental equation for understanding how photosynthesis compliments respiration. Do you know what the most critical thing for life on earth is? It’s sunlight. Sunlight is responsible for providing life on earth with everything it needs: water, oxygen, and food. Yet we clearly can’t sustain ourselves with just sunlight, so how does this sunlight get converted into the key ingredients for life? This happens through the process of photosynthesis. Photosynthesis is how plants are able to convert the radiant energy from sunlight into glucose, the food that they need and that animals need. As a byproduct of this process plants also create water and oxygen. Humans and many other animals feed off of plants and ingest the water and oxygen that photosynthesis creates. Photosynthesis drives life on earth, but how exactly does it work? 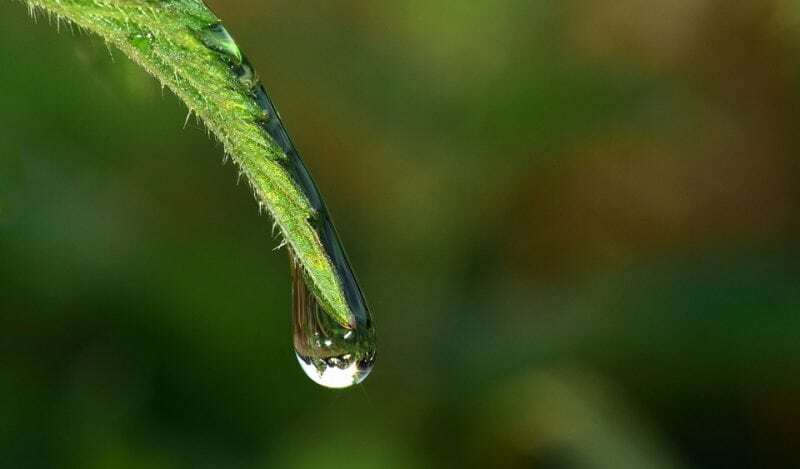 Let’s take a closer look at the balanced chemical equation for photosynthesis, and contextualize it by examining how it is part of the plant’s lifecycle. This translates to the production of glucose and oxygen from carbon dioxide and water. O2 Is known as dioxygen but frequently referred to as simply oxygen. Vertebrates rely on oxygen to convert glucose into ATP, the energy that enables the cells of an animal to carry out their functions. Oxygen is brought into the body by the respiratory system, and then red blood cells pick it up for use. C6H12O6 can technically refer to many different molecules since it is dependent upon how the atoms within the molecule are arranged. Most of the molecules that the formula can refer to are sugars of one kind or another, and the most widely known formation of the molecules is glucose. Glucose is converted into a substance known as pyruvate in the cells of animals, which is then utilized to generate ATP. Glucose is also known by a variety of other names including blood sugar and dextrose. So what happens when the cells of animals utilize the glucose and oxygen produced in plants, along with water, to live and carry out their functions? The process of cellular respiration releases byproducts, much as the process of photosynthesis does. These byproducts are 6CO2 + 6H2O. In other words, cellular respiration releases water and carbon dioxide. Notice anything about how these byproducts are related to photosynthesis? They’re the exact ingredients that photosynthesis uses to create glucose and oxygen. This means that the two processes are intertwined, relying on the byproducts of one another to function. This interdependent relationship is known as the carbon cycle, and it is what enables the vast variety of life on earth to exist. The carbon cycle is what allows carbon molecules to move through the entire biosphere, being recycled and allowing both plants and animals to live. The carbon that is released into the atmosphere by cellular respiration and animals is released as carbon dioxide, while plants absorb the carbon dioxide, get it out of the atmosphere, and release oxygen instead. The key part of a cell involved in cellular respiration is the mitochondria. Mitochondria are often known as the powerhouse of the cell, as they generate the energy the cell uses. Cellular respiration takes a molecule of glucose and transforms it to generate ATP. Some ATP is produced during the transformation of glucose, but more ATP is made during the process of phosphorylation. Oxidative phosphorylation occurs as electrons move through the “electron transport chain”, deep within the membrane the mitochondria. Glycolysis is the first part of the process, and it transforms the glucose into pyruvate. The pyruvate is then oxidized, to create a compound called acetyl CoA. As a result, carbon dioxide is released. More carbon dioxide is released during the citric acid cycle, the next step of cellular respiration. The acetyl CoA created in the last phase combines with a four-carbon molecule during this phase. The final part of cellular respiration is oxidative phosphorylation, and it sees the creation of more ATP as electrons move down the electron transport chain. The oxygen cells use in this phase is combined with electrons and protons of hydrogen to form water. Plants cells have a structure called a chloroplast within them, which generates energy, being analogous to the mitochondria in animal cells. Chloroplasts are examples of organelles called plastids, found within the cells of plants. Chloroplasts convert solar energy into carbs, by trapping wavelengths of light. When the light energy is absorbed, it starts the process of photosynthesis, as long as the plant has sufficient water and carbon dioxide. Different plants can absorb different wavelengths of lights utilizing different pigments. Most plants are green, the color coming from the chlorophylls in the cells of the plant. However, there are other pigments like carotenoids and phycobilins that absorb different wavelengths of light and give plants different colors. Through the processes carried out in both mitochondria and chloroplasts carbon can cycle through an environment rather quickly. It is estimated that between 1,000 to 100,000 million metric tons of carbon go through the carbon cycle a year. The biological carbon cycle accounts for what happens to much of the carbon on Earth. There’s another type of carbon cycle though. It’s the geological carbon cycle, and it refers to the way carbon is stored and released by parts of the Earth itself. 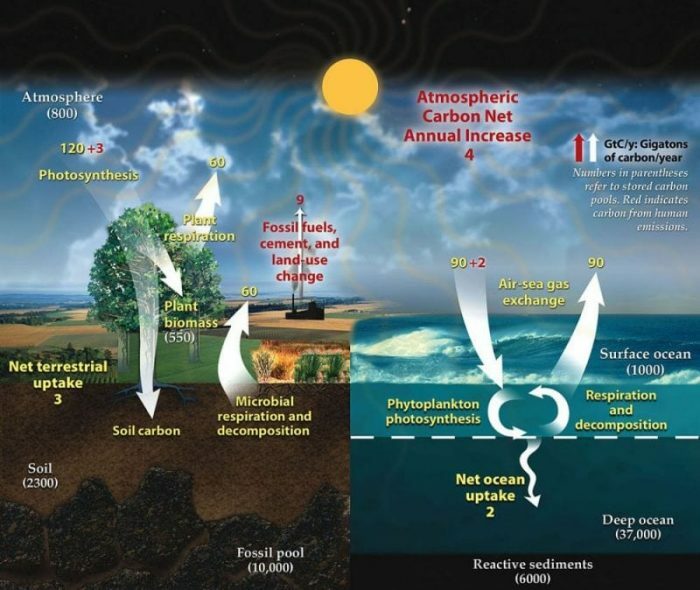 The amount of carbon in the atmosphere depends on how much carbon is stored in the ocean and in the soil. The remains of carbon-based ocean life become sediment, which becomes part of the seafloor. Geological processes turn sediment into limestone, and limestone is thought to be the largest reservoir of carbon on the planet. Carbon can exist as both inorganic and organic carbon on land. Organic carbon refers to the decomposition of dead animals while inorganic carbon is stored in a variety of rocks and minerals. The process of weathering releases this carbon into the atmosphere. Carbon may also be released into the atmosphere through the eruption of volcanoes, or through the combustion of fossil fuels mined out of the ground. The biological carbon cycle and the geological carbon cycle are dependant on one another. Most carbon is found in the ambient air as carbon dioxide. Carbon dioxide dissolves into water, where it produces a molecule called bicarbonate. Bicrobaronate and carbon dioxide are converted into organic molecules by bacteria and plants through photosynthesis, which moves up the food chain while cellular respiration turns this organic carbon back into C02. As carbon cycles through the biological and geological carbon cycles, it plays an integral role in photosynthesis. Photosynthesis drives life on Earth by allowing energy from the sun to sustain lifeforms at all levels of the food chain. Previous Post« Previous What Are Scallops?